What do you usually do with your evenings? Let me guess! Too tired to talk to your family you hastily cook dinner and spend the rest of the night crashed out in front of the TV? 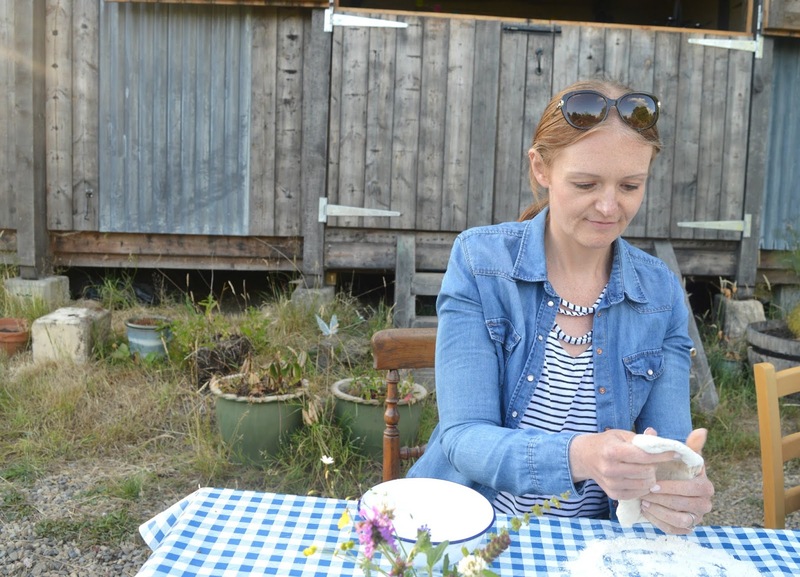 Last week we rediscovered the joy in long Summer evenings and broke away from our usual dreary routine to travel into rural Northumberland for Bats and Pizza Night with Wild Intrigue at Wild Northumbrian. 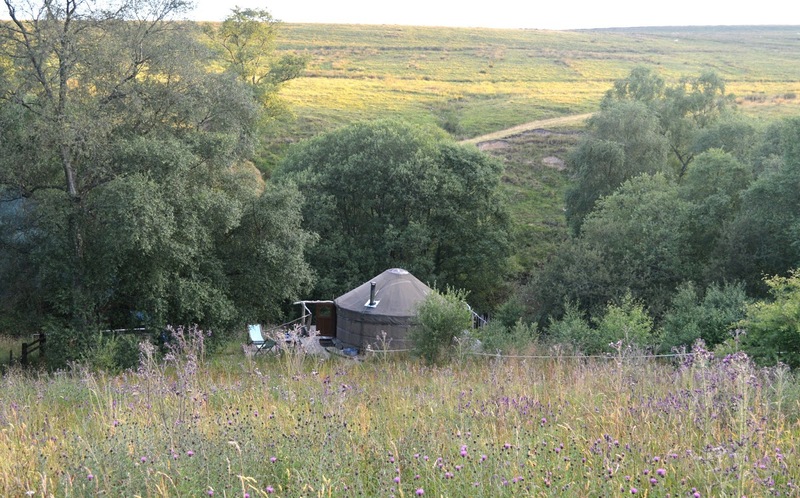 If, like us, you're not experts in rural glamping in Northumberland you may have never heard of Wild Northumbrian but if you love the great outdoors, getting back to nature and the stunning dark skies of Northumberland you really need to plan a visit. 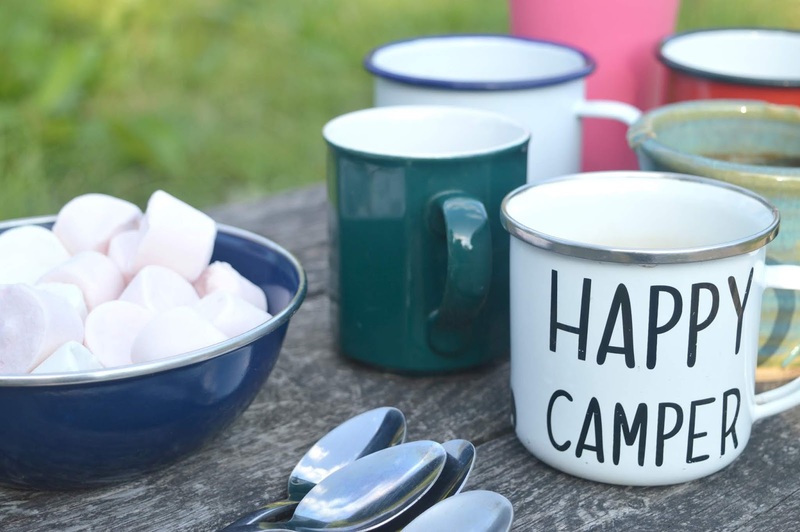 Wild Northumbrian is a camp site with a difference, home to five yurts, a shepherd's hut and tree house it gives a full rural glamping experience in the most perfect setting. It's also home to mini expeditions run by Wild Intrigue. 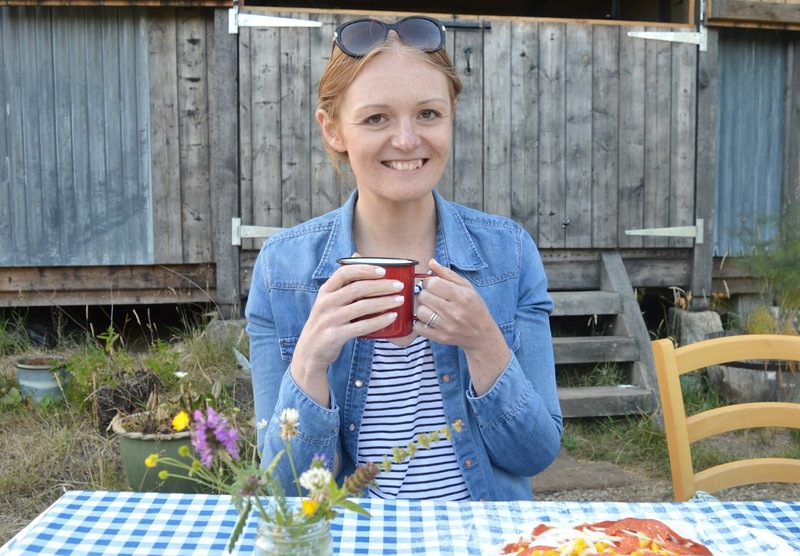 Passionate about "rewilding" visitors they host the most fantastic nights at Wild Northumbria - educating and inspiring their guests to fall in love with this beautiful part of the world - the perfect chance to rediscover a beautiful country life that many of us have probably long forgotten. The journey from our home in Newcastle took just over an hour and, following the detailed directions from Wild Intrigue rather than our useless SatNav (pretty sure Simon hasn't forgiven it yet for leaving us stranded on a single track road covered in cows) we managed to find Wild Northumbrian where we were met by Wild Intrigue's leaders Heather and Cain and were taken to our base for the night, the most charming Pole Barn. 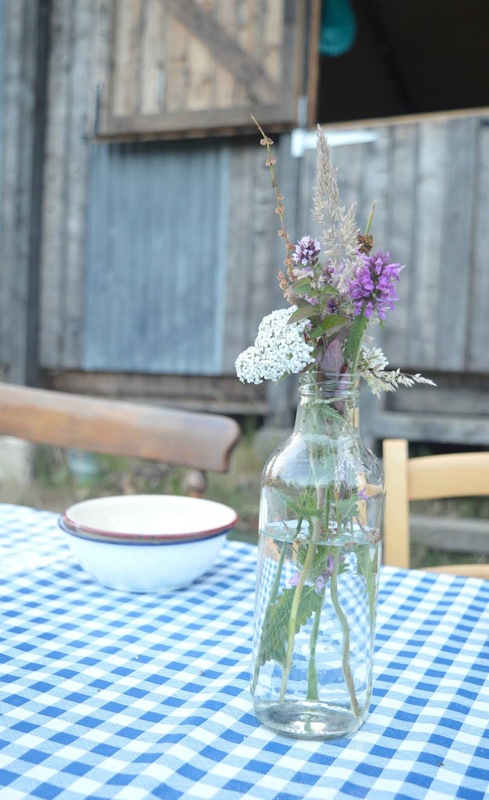 Sitting down at a beautiful table (far prettier than the table at home where we'd usually have our evening meal!) 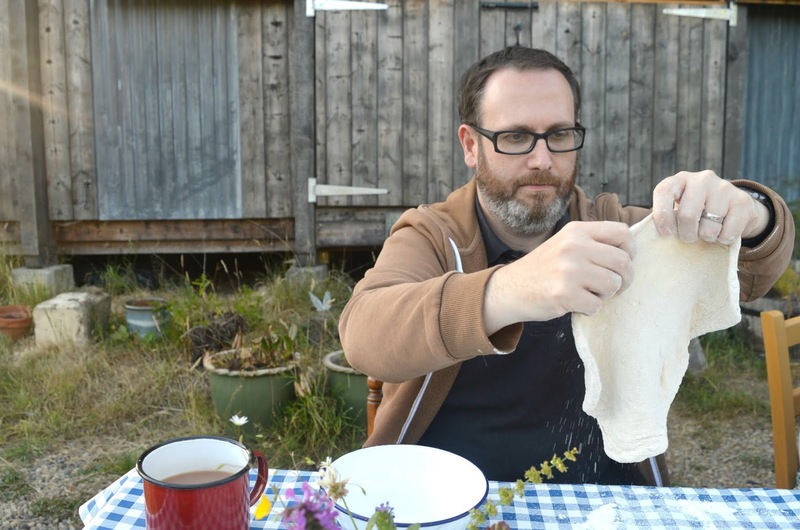 we each had a bowl of ready made pizza dough in front of us to prepare for our pizza base. 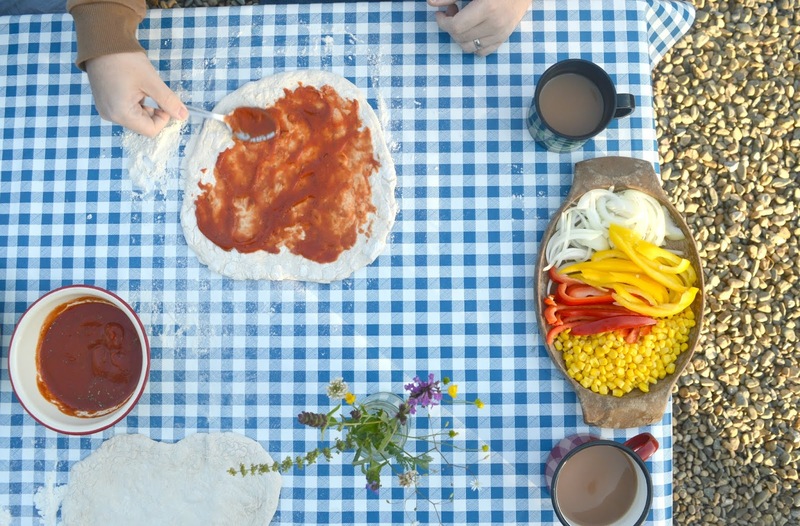 The perfect way to combat the stresses of the day, we happily chatted in the sunshine whilst kneading our dough into something resembling a pizza shape. Trust my husband to be Northumberland's best pizza maker. We were all stunned into silence at his perfect round base (he took it so seriously he ended up with flour all over his nose!) and, after refusing to swap with me (how mean!) he proceeded to cover it in toppings as fast as he could before I could swipe it. 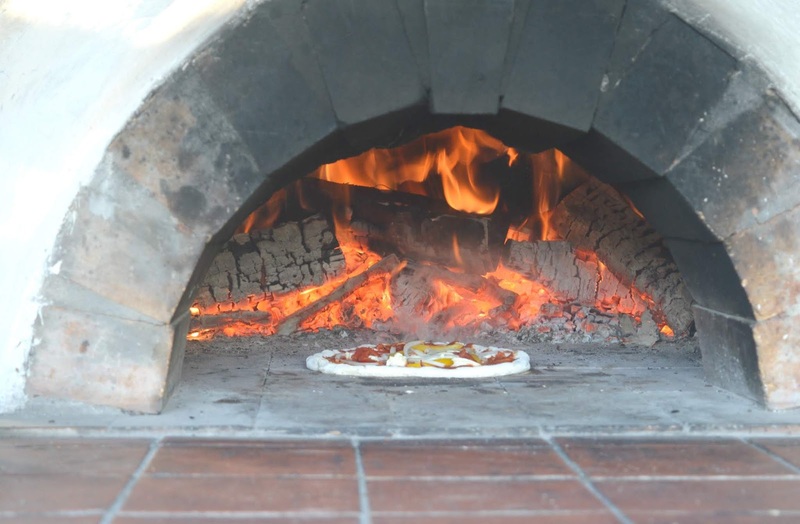 I've never seen anyone move to a pizza oven so fast! 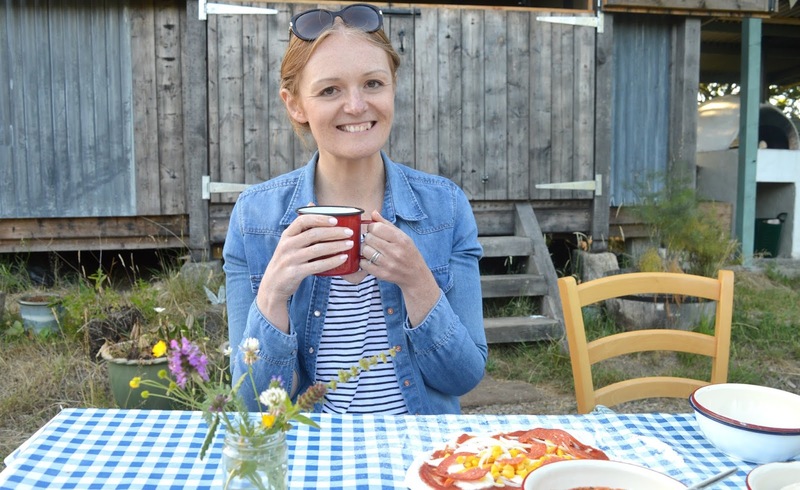 Our stone-baked pizzas took only a couple of minute to cook in the pizza oven and then we got to enjoy them with hot cups of tea whilst enjoying the last of the evening's sunshine. They were far superior to any pizza I've ever had before - made extra special by our beautiful surroundings. 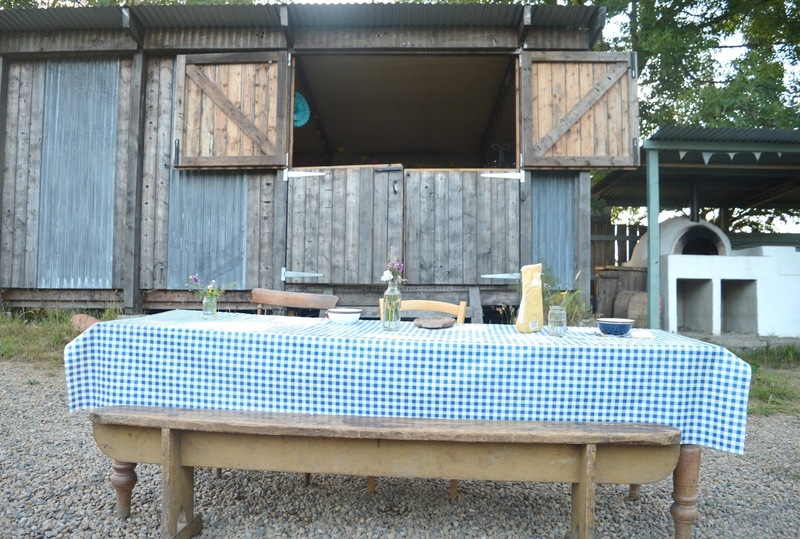 When we'd arrived at Wild Northumbria I'd hoped that my husband would soon be planning us a little glamping trip, but instead I caught him googling pizza ovens! With full tummies it was time to explore and we followed Heather and Cain around Wild Northumbrian for a little look at the campsite whilst foraging for blackberries (something that immediately reminded me of my childhood) and keeping our eyes open for wildlife. Heather and Cain thrilled us with stories of their expeditions and conservation work and told us all about the camera traps they had set up around Wild Northumbrian as part of their survey of the wildlife at the camp. As soon as I heard we were near a badger's set I had everything crossed we'd get to see one and although we weren't lucky this time I did get to see one on one of the camera traps and it was such a lovely moment. The badgers may have been in hiding but we did spot something very special - a red squirrel sitting in the trees staring straight at us. Simon and I are a little obsessed with red squirrels and have been known to spend many an hour sat in the woods waiting for them so it felt amazing to be squirrel watching with other enthusiasts. We all quietly crept through the trees for a closer look and it was so great that we all got to see him before his fluffy red tail vanished off up the trees. 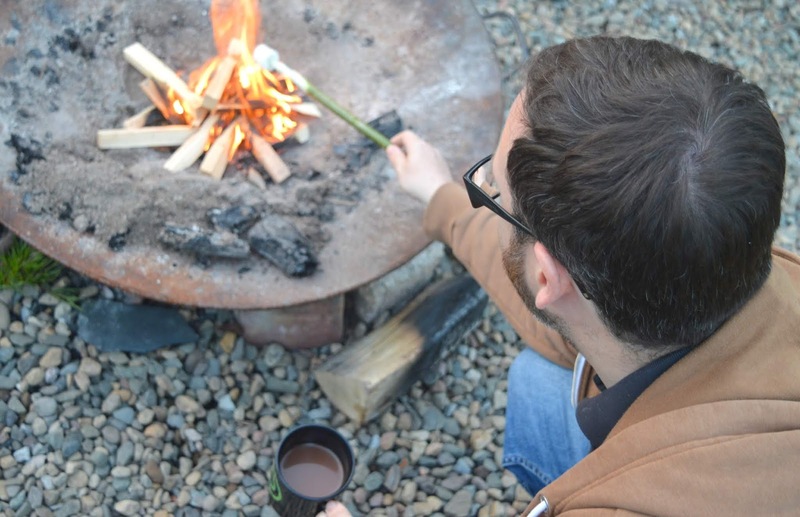 We celebrated our successful adventure with hot chocolate and marshmallows by the camp fire. Cain expertly made us the perfect marshmallow toasting sticks out of Willow and we helped ourselves to endless little pink and white pillows, claiming that each one had "gone wrong" in an attempt to justify getting more. 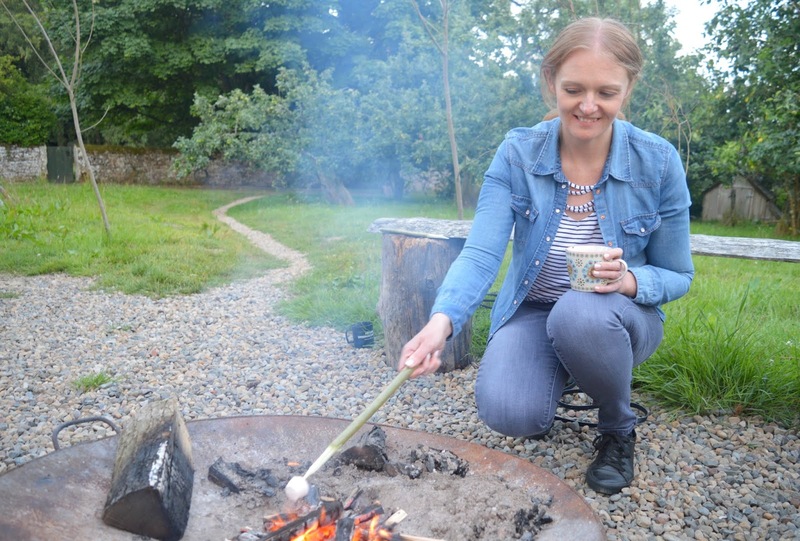 I'd forgotten how amazing marshmallows taste when they've been singed in the camp fire - the secret is to let them catch light just a little, blow out the flame and then you're treated to the most amazing smoky taste with a gooey sweet centre. We were having so much fun toasting marshmallows and chatting about our red squirrel encounter we'd almost forgotten about the real stars of the night - the bats! Heather gave us a little taster of what was to come by describing the different types of bats that you can find in Northumberland and demonstrating how to use the bat detectors. 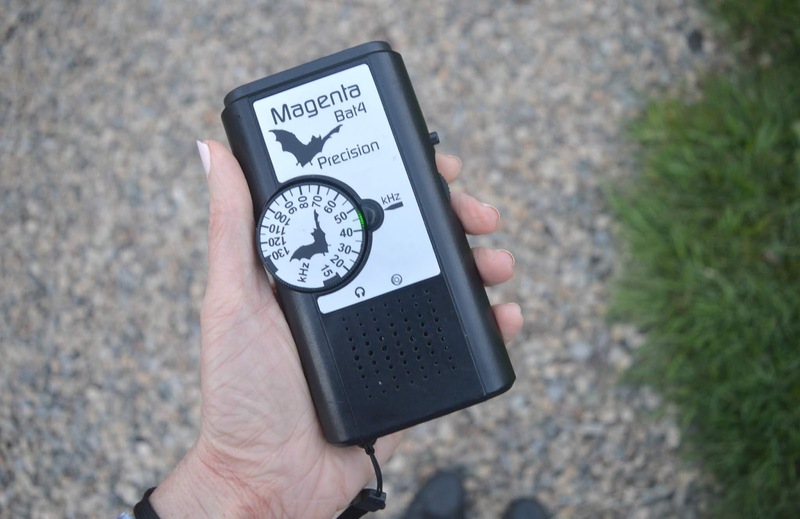 Bats call to each other using high frequency sounds that are almost impossible to hear but with the help of the detectors these sounds become audible allowing us to track the bats. Each type of bat makes a different kind of noise which makes it easy to identify them. With the sun just beginning to go down we headed off to the grave yard to see if we could find some bats. It wasn't long before our detectors were making a clicking noise and then we suddenly spotted a bat circling above our heads. Before we knew it there were loads of bats and the clicks of my detector were so clear each time a bat flew over my head it really did feel like we were eavesdropping on their private conversations. It was one of the most incredible experiences of my life and something I know I'll remember forever. 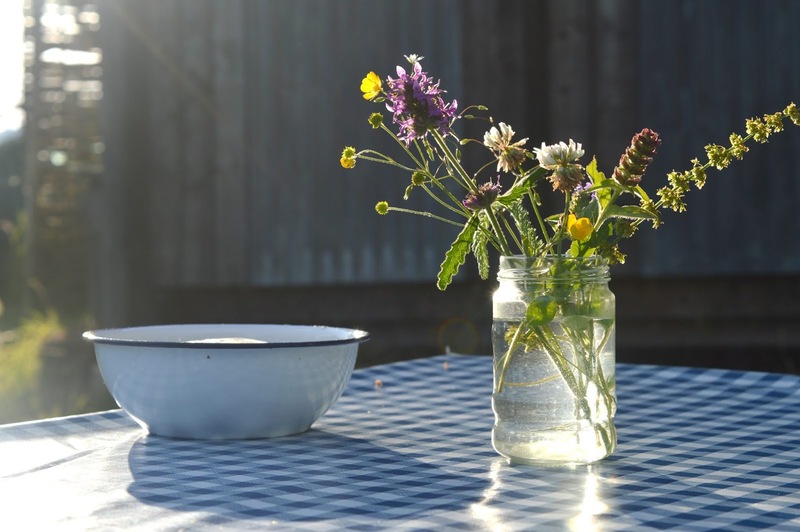 My night with Wild Intrigue transported me back to a time long ago - where Summer night's lasted forever and I'd run outside for hours, grass in my hair, mud on my knees, fully immersed in a world of nature. I'm not sure exactly when I'd stopped feeling so carefree and swapped my evenings of adventure for mountains of laundry but I'm so thankful that for a few hours on a Tuesday night I managed to feel truly content, something that I've not felt for years. This probably all sounds a little too good to be true, but I promise you, an evening with Wild Intrigue and you'll find yourself heading home with the same feeling! As for my reluctant glamping husband, it seems that Wild Northumbria truly worked its magic on him too because he's agreed to organise a trip there one day! What a wonderful experience and a bit of a bargain too! Definitely adding this to our list of places to visit! It's an amazing price isn't it! £10 for an adult ticket and you get so much for it! Aww this sounds amazing. Definitely going to take the kids!! We had a couple of kids in our group and they loved it! I still haven't recovered for how amazing Simon was at making pizza - he was so smug! The girls would love it!